Launching a new intranet is more than just giving employees a new software tool — intranets enable organizations to change the way they work together. While ThoughtFarmer is very user-friendly and intuitive, employees need training on new processes and best practices specific to your company’s intranet. Plus, for your less tech-savvy employees, training gives them a boost of confidence to get started with the intranet. 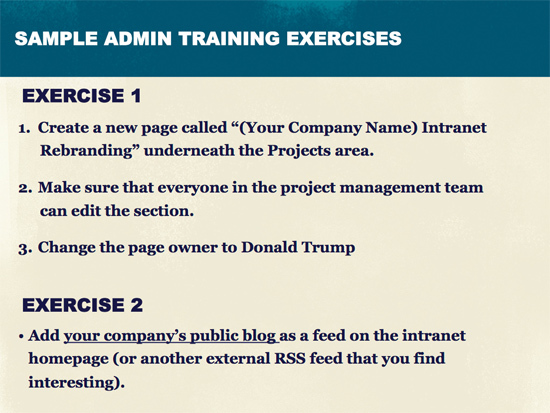 Here are some tips to help you design your intranet training. Executive intranet adoption is important. They hold the keys to budgets, strategic direction, governance, and more. Plus, they are key ambassadors that other employees will follow. So plan to give them one-on-one training when and how they want it. You could even set up a “reverse mentoring program,” in which younger, tech savvy employees help executives get comfortable with the new intranet. Engage executives early. 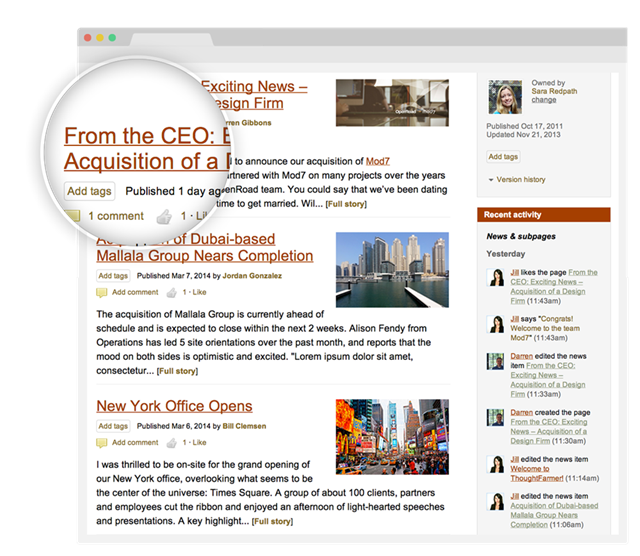 Once employees see them starting to use the intranet as a tool, employees will want to use it too. This approach gives you the flexibility to include both technical training and best practices (e.g. a “writing for the web/intranets” portion of your “News publishers” training). Create exercises for each training group that match the tasks they will use the intranet for everyday. Many intranets are plagued by a common problem: They’re disconnected from offices outside of HQ. One way to break this pattern is by building up power users in each office and maintaining strong relationships with them. ACU hosted special training for their intranet champions. Listen to a clip from their case study webinar about how they did it. In order to make users comfortable, you need to create a welcoming environment. Frame the training as “I’m here to help you get the most out of this cool new tool” rather than “you must use this now!” Use language that reinforces the proper messages and bring a corresponding attitude. Create a forum where users can post questions and anyone can answer them. Encourage your super users to post answers through the standard set of enticements — recognition, chocolate, beer. Now that you’ve trained everyone, the next step is to reinforce what they’ve learned and help them apply it to real life scenarios. You can provide this training in-person, online or both ways. Pro-tip: providing snacks at the weekly intranet drop-in is a good incentive to get people interested in attending and learning more. 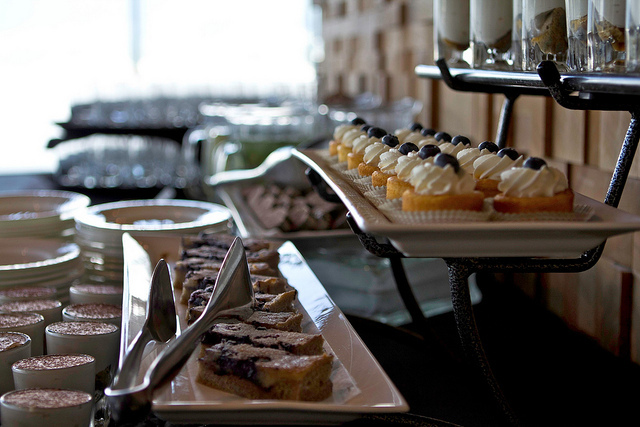 Hosting a weekly drop-in intranet help session with complimentary snacks is a great way to reinforce training messages. There can be a big gap between “training” and “learning.” The former is a thing that happens at a specific time. The latter is an ongoing process. Provide refresher courses that are shorty, pithy and flexible enough to adapt to attendees’ needs. Consider creating videos on specific topics that can be used as refresher courses.